These two are awesome. So much fun. So down to earth. So incredibly in love. Luke & I met up with these two on a cloudy Sunday. We were worried it might rain on us but the clouds held off and we were able to get some amazing pictures with these two and their pups! The Inn at Warner Hall is where Jack & Lacey will be tying the Knot next November. This venue is especially sweet because this is where Lacy’s mom got married. Luke & I cannot get enough of this gorgeous place! The house, the land, and even the large chess set has our hearts! The view is incredible and is such a beautiful getaway from the everyday noise. Their wedding is going to be one for the books! I already know! Not because they have incredible style, cute pups, or even are an amazingly good looking couple… Which all of the above are true. Their wedding is going to perfect because they are going to be getting married! They are meant for one another and we are so happy to capturing the beginning of their happily ever after! Thank-You Jack & Lacey for trusting us to tell your story! We are truly honored and cannot wait to celebrate with you in 11 months! Sharing some of our favorites from their incredible session! Love this Black & White! So classic! 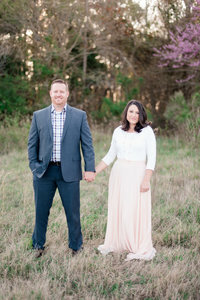 See their engagement session feature on Let’s Wed Hampton Roads!